Fancy yourself a crack shot? Do you enjoy painballing but feel like it's missing something? Do you want a combat sport to play with your friends in a safe environment? 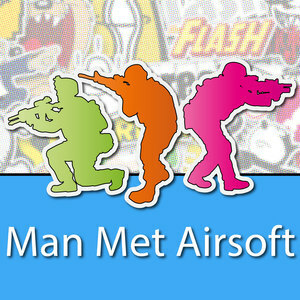 Airsoft might be for you! We aim to host regular socials to get to know each other, and game days for members to play together and against each other at some of fantastic sites in the North West. Membership is only £5 and comes with several benefits including discounts at our local airsoft store and the opportunity to join us for game days. Please read our Terms & Conditions of Membership below - It's a short list don't worry! By Joining this society, you agree to follow the Society's Code Of Conduct when attending events, travelling to and from events and attending socials. 1. RIFs are always to be transported using a suitable container. The box they came in, a soft case or a hard case are all acceptable. No part of the RIF should be visible when in transit. 2. RIFs are never to be used or displayed in Public or within sight of the public. Only on private property or game sites shall RIFs be used/shown. 3. When using your own equipment, it is the player's responsibility to ensure their RIF is within UK field limits and site limits. Standard site limits are 350fps (0.2g BB) for Automatic RIFs and Sidearms, 450fps (0.2g BB) for Semi-automatic RIFs, 500fps (0.2g BB) for Single Action RIFs. Any member's RIF over these limits will be refused entry to games until proof of downgrade has been provided. 4. Bullying, racism, harassment or otherwise discriminatory behaviour of any kind will not be tolerated, and will result in a ban from attending the society's events. 5. Members are expected to be courteous to any members of the public, transportation staff, site staff, marshals or other players encountered when attending any society event. Members will be dissallowed from attending events if in breach of this. 6. You agree to advise the committee of any pre-existing medical condition or disability that may impede your ability to play airsoft, attend events or attend socials. This information will only be shared with venue owners when booking events if applicable (for example, allergies are relevant to any event involving food/drink).